Day 1 Transfer from Sofia to Kerkini Lake (Northern Greece) Landing at Sofia International Airport (Bulgaria) with transfer journey of about 3 hours to Lake Kerkini in Northern Greece. During the transfer we will visit the famous Rila Monastery in Bulgaria. The monastery was built in the 10th century AD and is listed in UNESCO’s List of World Monuments of Culture. The monastery has been designated as one of the most significant heritage and cultural sites, not only in Bulgaria, but of the entirety of Southern Europe itself. We will stay at a very comfortable guest house located in a small village near Kerkini Lake, for the next three nights. Day 2 & 3: Birding & Photography at Kerkini Lake Kerkini Lake is located in Northern Greece, not far from the Bulgarian border. The lake and its surroundings are considered as one of the most interesting birdwatching sites in Greece. The lake itself has a rich bird fauna all year round and has protected status granted under the Ramsar Convention. The Park has documented over 300 differing bird species sighted as present. During the next two days we will have the perfect opportunity to combine birding with photography. 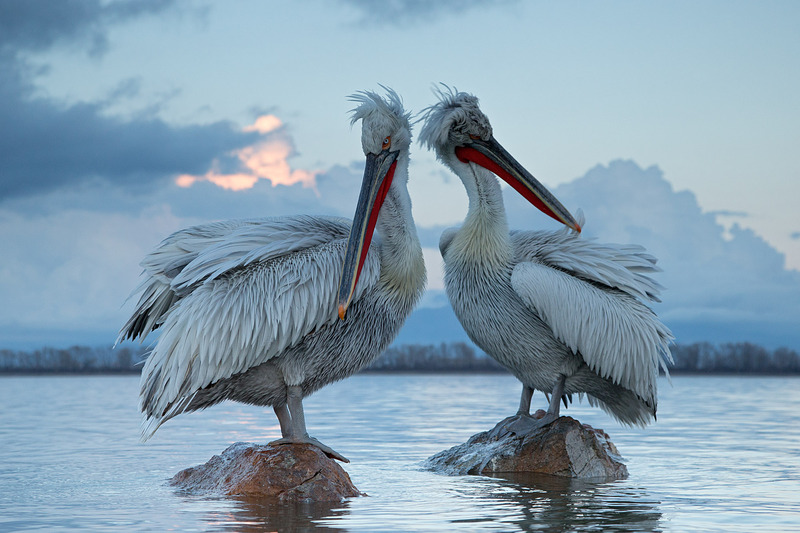 Kerkini is considered one of the best places in the Balkans for Pelican photography - and many others. During the tour we will have the opportunity to get very close to the birds. Photography takes place from a boat spending around 2 hours in the morning and 2 in the afternoon to cater for different light conditions/levels. Between the sessions we will continue with the boat trip and shore observations around the lake. This will give us good chance to observe & photograph other species. 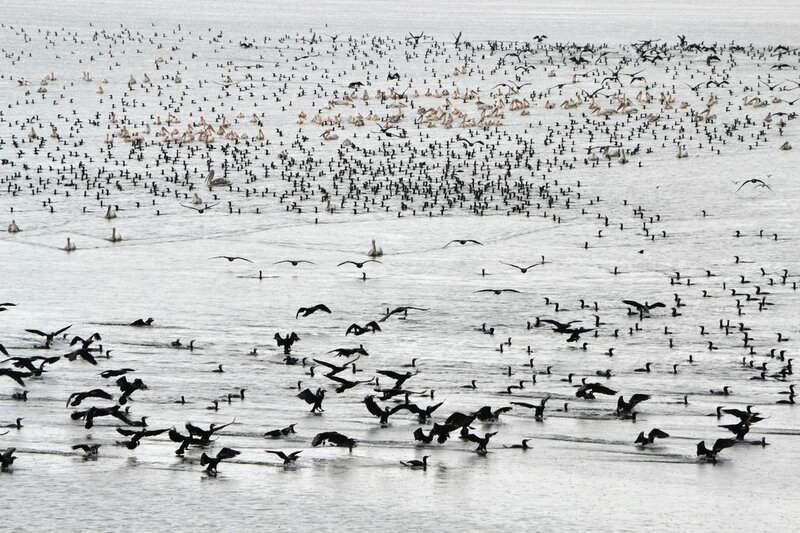 During the winter, Kerkini is a bird rich area. Ducks of more than 10 species are in and around the lake in good numbers with Mute, Whooper and Tundra Swan, Dalmatian Pelican, Ferruginous Duck, Greater Flamingo and White-fronted Goose can be seen. If lucky, the rare Lesser White-fronted Goose and even rarer, Red­ breasted Geese, can also be found. Many over-wintering raptors include Greater Spotted Eagle, many Buzzards, Sparrowhawk, fewer Marsh and Hen Harriers, fewer Goshawk, Peregrine Falcon, Merlin, Common Kestrel and sometimes Imperial Eagle. Day 4: Nestos Delta, Porto Lagos Area & Lake Vistonida After breakfast we transfer (3 hours) to the Nestos Delta. Mostly driving along the coast we will explore a wide range of habitats including: lagoons, marshes, saltpans and lakes which often offer a wide range of birds. Our first stop for the day will be in the area of Keramoti village, visiting local lagoons, where we expect to see: Red-necked Grebe, Common and Velvet Scoters, Black-throated Diver, Black-necked Grebe & Mediterranean Gull. We continue towards Porto Lagos and Lake Vistonida. Dalmation Pelican is common, particularly in winter here, as well as White headed-Duck. The woods near the Porto Lagos village can provide us with: Syrian and Great Spotted Woodpecker, Warblers, Tree Pipit, a lot of species of Herons & Pygmy Cormorant. Around Vistonida lake: Black, Whiskered, Gull-billed Terns, Sandwich Tern, Little Ringed Plover, and Oystercatcher. Other possible species for the area are: Smew, Gadwall, Short-eared Owl, Calandra Lark, Hen Harrier, Spotted Eagle, Grey & Golden Plover, Bar-tailed Godwit, Avocet, Turnstone, Great Bittern and others. We will overnight at the small village of Fanari located near to the Thracian Lagoons. Day 5: Lake Ismarida and Eastern Rhodope Mountains Today we will again cross the Bulgarian-Greece border on our way to the Eastern Rhodope Mountains. The Eastern Rhodopes is an area of rich biodiversity and is widely considered to be one of the best places in Europe to find large birds of prey. There; during the next couple of days - we will use special hides for observation and photography - of some spectacular large birds of prey which inhabit the area. Sometimes the feeding station in-front-of the hides is visited by Wolves & Red-foxes. Before crossing the border into Greece we will make one final observation at Lake Ismarida, where we can expect to see many wildfowl. Although the lake is part of the Thracian Lagoons, it is treated quite separaetly because of its 'largely freshwater' character. Possible species: Mallard, Shelduck, Teal, Black-necked Grebe, Ferruginous Duck, Corn Bunting, Spotted and White-tailed Eagles (are possible), Bittern, Little Gull, & Water Rail. In late afternoon we will reach the Eastern Rhodpoes and the small village of Gorno Pole. For the next three nights we will be accommodated at a delightfully comfortable & charming guest house which serves only organic food. For the next two days our main focus will be the large birds of Prey of the Eastern Rhodopes. For our observation and photography sessions we will use two specially erected wooden hides located in front of a feeding station. The second hide is more appropriate to photograph birds in flight. We will split into two groups, rotating day-by-day usage of the hides, ensuring equal and fair access for you all. We will have good chance to observe and photograph: Golden Eagle, Griffon Vulture, White-tailed Eagle (and fingers-crossed), Black Vulture. And sometimes; Foxes, Wolves & Jackals. To ensure a good chance of success the days will have early starts with just a 40 min. transfer from our accommodation to the hides. We will spend both days in the hides until sunset or/and until the light is good enough to meet your needs. Both hides are equipped with heating and portable WC. Note: distance from the hides to where the birds typically land is between 20m - 40m. Accordingly 300-800mm lenses will be appropriate. Day 8 Transfer to Sofia & Departure A transfer of about 3.5 hrs follows for our departure flight from Sofia. During this tour we will visit some of the most prominent bird wintering sites in Eastern Europe. 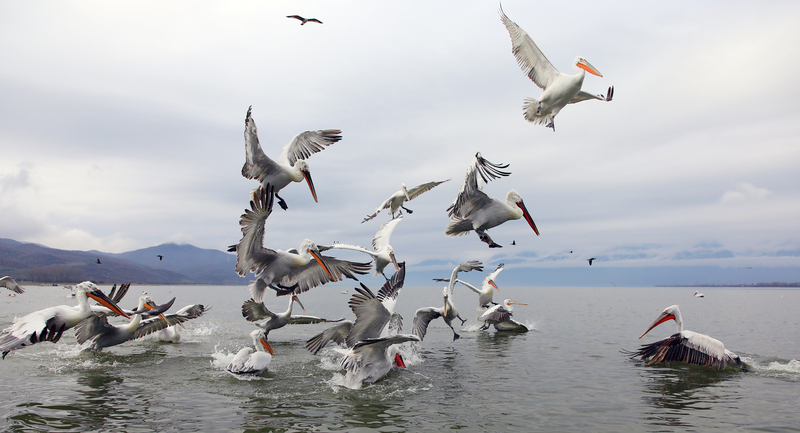 Kerkini Lake in Northern Greece is well known as such a site with brilliant birdlife. 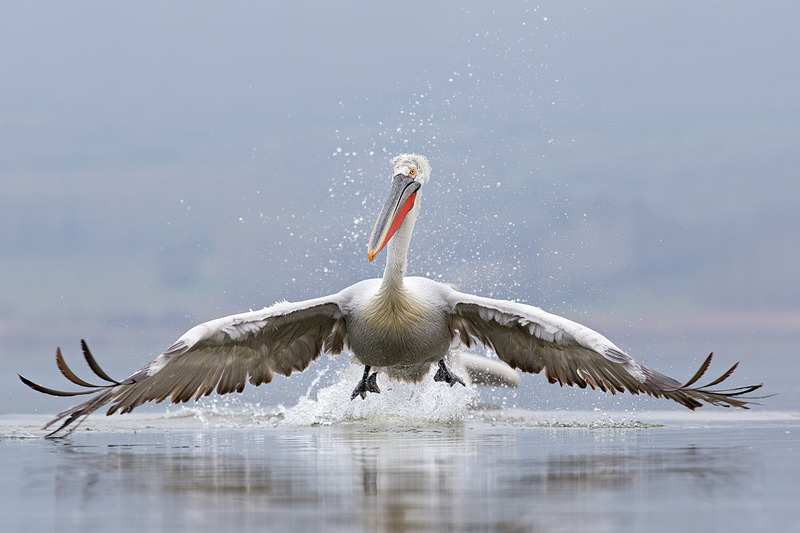 We will have a closer look at one of the local wintering specialties, the globally threatened Dalmatian Pelican. Exploring the lake by boats will allow us to approach this enigmatic bird just to a few feet and thus have a perfect photography opportunities. Together with the Dalmatian Pelicans at Kerkini we will have a lot of wildfowl species as well as some raptors as Greater Spotted Eagle, White-tailed Eagle, Marsh Harrier, Hen Harrier and more. For the second part of our tour we will visit the Eastern Rhodope Mountain in Bulgaria. Eastern Rhodopes are area of exceptional biodiversity and well known as one of the best places in Europe for large birds of prey. For a few days we will use specially erected wooden hides next to a feeding station, which attracts good number of large birds of prey. We will have the great chance to observe and photograph the spectacular Golden Eagle as well as Griffon and if lucky Black vulture. Sometimes the feeding station is visited by Foxes, Jackals & Wolves, giving us the chance for some unique shots. THE PRICE INCLUDES: ground transport, full board (packed lunch where and when is necessary), accommodation, guide, entrance fees for all nature reserves. THE PRICE DOES NOT INCLUDE: airfare, travel insurance, drinks and all items of personal nature. Payment may be made in all convertible currencies at the euro exchange rate for the day of payment.